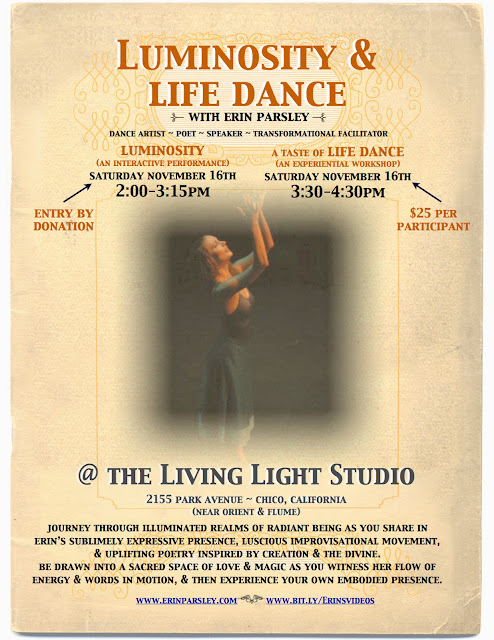 Journey through illuminated realms of radiant being as you share in Erin's sublimely expressive presence, luscious improvisational movement, & uplifting poetry inspired by Creation & the Divine. Be drawn into a sacred space of love & magic as you witness her flow of energy & words in motion. Erin is excited to return to Chico and share her inspired artistry with you! Discover the creative, passionate gift that you are and flow into harmony with your body, through a transformative experience interweaving movement as meditation, joyful self-reflection and sacred expression. Discover your self-love, value and worthiness, as you realize the innocent, infinite YOU that is untouched by any life experience. Your ESSENCE is perfect. Your spirit is BEAUTY. Tap into your true freedom and let Life Dance Through You! 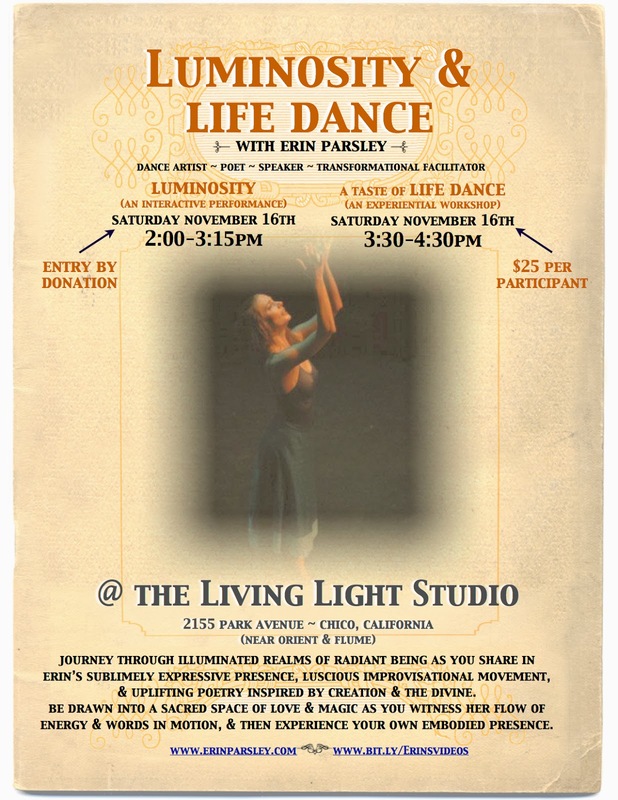 “Luminous… Soul dancing… Soul speaking! “Beautiful ethereal and masterful dancing. Channeling of beautiful spiritual energy. "Inspiring me to dance life more like I used to! Thank you for your beauty & energy! “I danced with you tonight. I moved and expressed and ached and cried and soared with you. "IT WAS A TOTALLY AWESOME PERFORMANCE, ERIN!! !